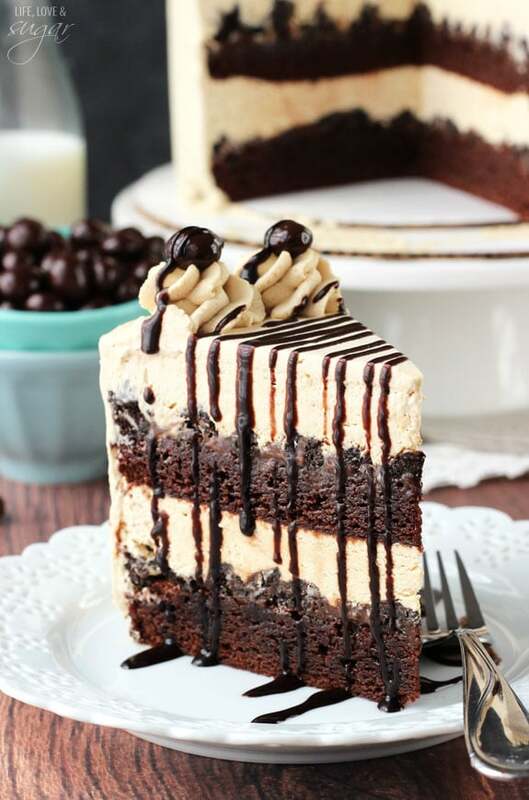 This Kahlua Coffee Brownie Cheesecake is made with a dense brownie on the bottom, topped with kahlua and coffee cheesecake and finished off with a layer of chocolate ganache and kahlua whipped cream! I am so in love with the flavors! This cheesecake has been a long time coming. I have been wanting to make it forever. 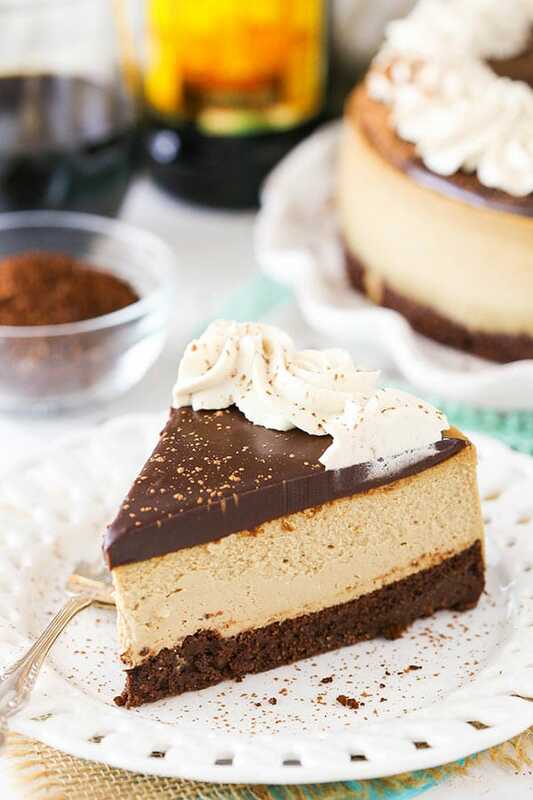 You could say it’s a copycat of the Kahlua Cocoa Coffee Cheesecake from the Cheesecake Factory. That was certainly the inspiration. But given my issues finding a springform pan that doesn’t leak, I was delayed in finding a springform pan I could bake a brownie in. I finally found one at Target a few weeks ago and this was the first thing I made. There were many versions of this cheesecake before I had it just the way I wanted it. First, the brownie. To bake first, or not to bake first? I tried it both ways. The bottom line is the brownie ends up super fudgy either way, but pre-baking is preferred. The brownie is better for slicing and serving if pre-baked. It really is fudgy, so the extra baking time is good. While the brownie bakes, put together the cheesecake filling. It’s a fairly straightforward filling. For the coffee and Kahlua flavoring, I used some instant coffee granules and Kahlua to get a good strong coffee flavor without having to add a ton of liquid. Works like a charm! I played around with more or less of both the coffee and the Kahlua and I love the final version. Just enough of both! After the cheesecake is baked and cooled, it’s time for the topping! First up is the chocolate ganache. I added some Kahlua to it to add to the Kahlua flavor and it’s wonderful. 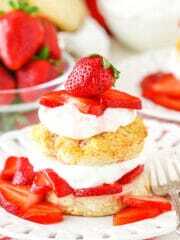 Spread it on top and let it cool for a few minutes while you make the whipped cream. The whipped cream also has Kahlua in it because more Kahlua is more better. 🙂 The powdered sugar in the whipped cream is the stabilizer so that it holds up well, so don’t be tempted to reduce the amount. Pipe the whipped cream on top, sprinkle on a little cocoa powder if you’d like and you’re ready to dig in! 1. Preheat oven to 350°F (176°C). Line a 9-inch (23cm) springform pan with parchment paper in the bottom and grease the sides. 2. Combine the butter, sugar and vanilla extract in a medium sized bowl. 3. Add the eggs and mix until well combined. 4. In another medium sized bowl, combine the flour, cocoa, baking powder and salt. 5. Add the dry ingredients to the egg mixture and mix until well combined. 6. Pour the batter into the prepared pan and spread evenly. 7. Bake for 20-25 minutes, or until a toothpick comes out with a few moist crumbs. 1. In a large bowl, beat the cream cheese, sugar and flour on low speed until well completely combined and smooth. Be sure to use low speed to reduce the amount of air added to the batter, which can cause cracks. Scrape down the sides of the bowl. 2. Add the sour cream and mix on low speed until well combined. 3. In a small bowl, combine the Kahlua and coffee granules and stir until the granules are dissolved. 4. Add Kahlua mixture and vanilla extract to the cream cheese mixture and mix on low speed until well combined. 5. Add the eggs one at a time, mixing slowly to combine after each addition. Scrape down the sides of the bowl as needed to make sure everything is well combined. 6. When the brownie is done baking, reduce the oven temperature to 300°F (148°C). Remove the brownie from the oven and pour the cheesecake batter evenly over the brownie. 7. Wrap the outside of the pan with aluminum foil, then place the springform pan inside another larger pan. (See my tutorial for preventing springform pans from leaking.) Fill the outside pan with enough warm water to go about halfway up the sides of the springform pan. The water should not go above the top edge of the aluminum foil on the springform pan. 8. Bake for 1 hour 15 minutes. The center should be set, but still jiggly. 9. Turn off the oven and leave the door closed for 30 minutes. The cheesecake will continue to cook, but slowly begin to cool as well. 10. Crack the door of the oven for 30 minutes to allow the cheesecake to continue to cool slowly. This process helps prevent cracking. 11. Remove the cheesecake from the oven and water bath wrapping and refrigerate until firm, 5-6 hours or overnight. Once completely cool and firm, remove from the springform pan. 1. To make the ganache, place the chocolate chips in a small heat proof bowl. 2. Combine the heavy whipping cream and Kahlua in a glass measuring cup heat just until it begins to boil. 3. Pour the hot liquid over the chocolate chips and allow to sit for 2-3 minutes, then whisk until smooth. 4. Pour the chocolate ganache onto the top of the cheesecake and spread evenly. 5. To make the whipped cream, add the heavy whipping cream, Kahlua and powdered sugar to a large mixer bowl. Whip on high speed until stiff peaks form. 6. Pipe the whipped cream onto the top of the cheesecake. I used Ateco tip 844. 7. Sprinkle the top of the cheesecake with cocoa powder, if desired. 8. Refrigerate until ready to serve. Cheesecake is best for 3-5 days. Hi. This looks divine! I’m curious which pan you ended up getting at Target. They have a “Bake Shop” brand at Target and it was that one. I tried to find it on their website for you, but couldn’t. I had to buy two though and test that at home. One was good, one was returned. Can I substitute the Kahlua for any instant coffee beans in water? Yes, the instant coffee granules can be dissolved in water instead of Kahlua. Can you use an 8′ Spring pan ? It might be a pretty full pan and you’d need to bake it for longer, but I suppose you could. The coffee is relatively strong in this because of the granules. 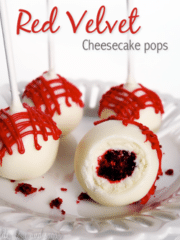 You can leave them out of the cheesecake filling and use something else – or leave it out altogether. The flavor just won’t be as strong. For the ganache, replace it with more heavy cream if you like. You can simply leave it out of the whipped cream. I hope that helps! If you’re going to indulge this is the way to go. This is one beautiful dessert! Lindsay, I’m not a huge Kahlua fan, so could you please, please please replicate the Cheesecake Factory’s “Chris’ Outrageous Cheesecake”?? It used to be called German Chocolate Cheesecake I believe. It is my FAVORITE and I’m dying to make something like it! OMG, I just googled it. How have I never seen that one before?! It looks insane!! It’s on the list! That is my favorite CF dessert. Yours looks gorgeous, delicious and I really want that layer of fudge on top right now. This looks so amazing! I bought your book and just received it in the mail today! I’m so excited! You are sooo baking goals! Thanks so much Lola! 🙂 I hope you enjoy the book! I am by no means a baker or cook for that matter. However, I was feeling adventurous and wanted to bring in something awesome for our teacher’s St. Patrick’s Day Potluck. This cheesecake was awesome! Thanks for your attention to detail in your recipe. I am so out of my zone in the kitchen, but as a science teacher, I know how to follow a proper procedure! Great job, everyone at school was impressed and now I’m hooked on your website. Perhaps I can be a baker after all. So glad to hear it! 🙂 Thanks Kali! I have made your chocolate cake for my daughters birthday and that was awesome. I actually made two cakes one I took to her and the other one stayed at home for me and my husband. I was searching a very long time for a moist chocolate cake and finally I found one. Thanks for all your recipes i can’t wait to try them all. This recipe looks excellent ! I was wondering if you can freeze the cheesecake if you should have any leftovers? I haven’t tried it, but it should be fine. Where do you get the kahlua? Liquor store, Target, Walmart, CVS or any drugstore… they all sell Kahlua! Depends on which state you live in! Liquor store is your best bet! You can skip putting the pan IN water, and put a pan (thin 9×13) of boiling water on the shelf directly below the cheesecake. You get the same results, and no worries about water leakage. My sister has been doing this for years. She makes wonderful cheesecakes, so I had never made one until recently. After the baking time was up, I left the oven closed for an hour. Turned out beautiful! Why does it want to crack when I take the springform off of it? Hmmm, it shouldn’t. Once it’s cooled, it should be nice and firm. I’ve never had a cheesecake crack after cooling. Just wondering why I can’t just use a boxed Brownie Mix?? Wouldn’t it taste the same and save time?? best dessert I have ever made, and I ALWAYS MAKE THE DESSERTS for our get together. The only problem I had was the whipped piping. I made it exactly as called for on the recipe, but it just wouldn’t stiffen up and peak for me. It still tasted great, but it ended up getting alittle flat and running down the sides of the cheesecake. BUT IT WAS THE BEST CHEESECAKE I HAVE EVER EATEN OR MADE!!! 5 stars!!!! Whip about 4 ounces of mascarpone into your whipped cream. It acts as a stabilizer and makes the whipped cream a little more firm so you can pipe it. It also prevents the whipped cream from “deflating” and it’ll keep the texture for a few days. And don’t worry, you can’t taste it at all, just tastes like delicious pure whipped cream! A great little tip for stiffening cream is to put the mixing bowl & the beaters in the freezer for 10-15 minutes before you want to prepare it. The cream stiffens much faster & you won’t over whip it with the very cold equipment. When do you take off the spring form pan ring? After the full cheesecake has cooled completely in the fridge. I added a little sentence to the recipe to help with that. Thanks Ken! It will just be thinner. You might also want to bake it for less time. This cheesecake is soooooo darn delicious….I made it for work a couple days ago……..
Don’t use margarine in the brownie! I loved the brownie recipe all by itself. I tried to make it with margarine and it was definately not the same. It was runny not thick like the butter. Baking time also different. This recipe is great as is. Even my boys, who say they don’t like coffee flavored things, loved this cheesecake (made for my daughter’s birthday). Like Jeanna though, I had problems with the whipped cream topping. Before it got stiff it turned to butter and I ended up pitching it. Once I get that problem licked this will be perfect! For the whipped cream, you could just add a little more powdered sugar. It stabilizes it. Do you cover the cheesecake when you put it in the fridge? I don’t always, but if you have a cake carrier, that’d be ideal so it doesn’t mess up the decor on top. Any advice for ensuring the alcohol burns out? I’m pregnant! Thanks!! 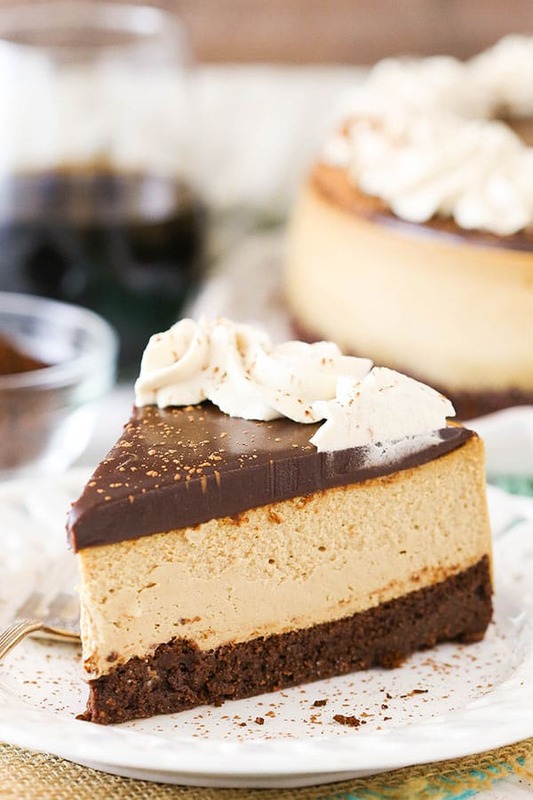 I don’t know that I can ensure that it’d bake out, but you could try boiling the Kahlua in the cheesecake and letting it cool before adding it. It already gets boiled in the ganache. And for the whipped cream, you can swap it out for more cream. 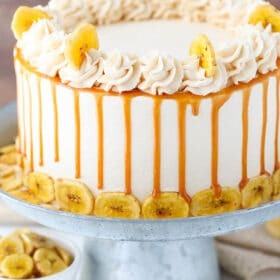 when putting this cake all together & after the cheesecake is finished baking & goes in the fridge for the 5-6 hours ……do you cover it while in the fridge? You definitely can, but you don’t have to. Yes, it should work fine. Thank you, thank you, thank you!! 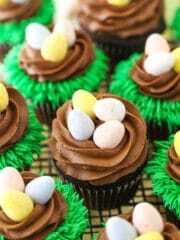 When I first saw this recipe I knew I was going to make it but had to hold off as my Mom gave up chocolate for Lent. It was our Easter dessert and It came out fantastic! I have to admit it looked as good as yours til I tried to decorate it with the whipped cream. I am going to have to practice my decorating with a tip a whole lot more. I thought that the Kahlua and coffee were a perfect mixture, not too strong, to me they were just right, though it smelled strong when I mixed it together. I am definitely making this cake again for my son’s wedding rehearsal dinner, we all have to bring something. Again, thanks so much for the recipe, the video for the recipe, the explicit, clear concise instruction, and your website. I am so glad I found you!! Wow! Made this today & it is possibly even better than the one at Cheeecake a Factory! 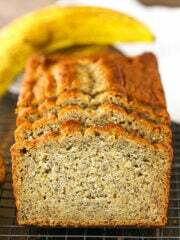 I was recently at the restaurant & tried to order this but they said it was recently discontinued & I was so bummed …..but now I know I have this recipe which is even better! Thanks!! Amazing!! You could probably make minis, but you’d certainly need to alter things a bit. I don’t have that type of pan. I don’t have much kitchen equipment at all. I do want to try this recipe. Could you possibly post a link to the pan you use, please?! This looks amazing. I’m going to skip the whipped cream, as we have dairy restrictions, and I need to use alternative ingredients. I’m also going to allow my three year old to taste a small sliver, so only cooked alcohol. Certainly, here is the pan I used. I made this over the weekend, and it was my first time making a cheesecake. 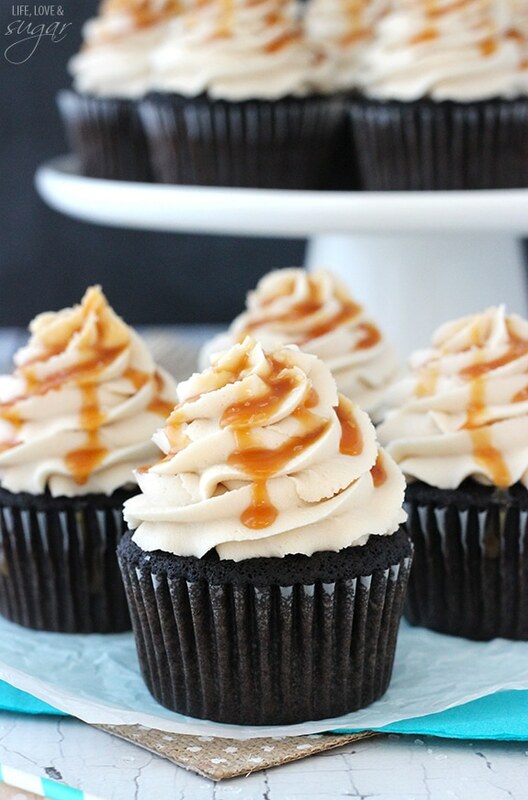 I used French vanilla Kahlua as well as French vanilla instant coffee and upped the vanilla extract slightly. My family thought it was crazy that the official name was “French vanilla Kahlua coffee brownie cheesecake” but they absolutely loved it. I still managed to get HUGE Y-shaped cracks, but I wasn’t able to find another pan large enough to place the springform pan into for the water bath baking. It gave the ganache space to seep in, so not a complete loss. I ended up using a full 12oz of chocolate chips and 7.5 Tbsp each of the Kahlua and whipping cream. That also gave me plenty ganache to do the sides of the cake as well. What size pan can you use for the water bath? I have the exact same red springform pan from Target. I might also try the pan-on-the-bottom-shelf idea proposed by Renee above. This turned out wonderfully rich and amazingly flavorful! Thank you so much for creating this recipe. I’m so glad you enjoyed it Nicole! I use a large 12 inch cake pan that I have for the water bath. Some people use a roasting pan or something like that. 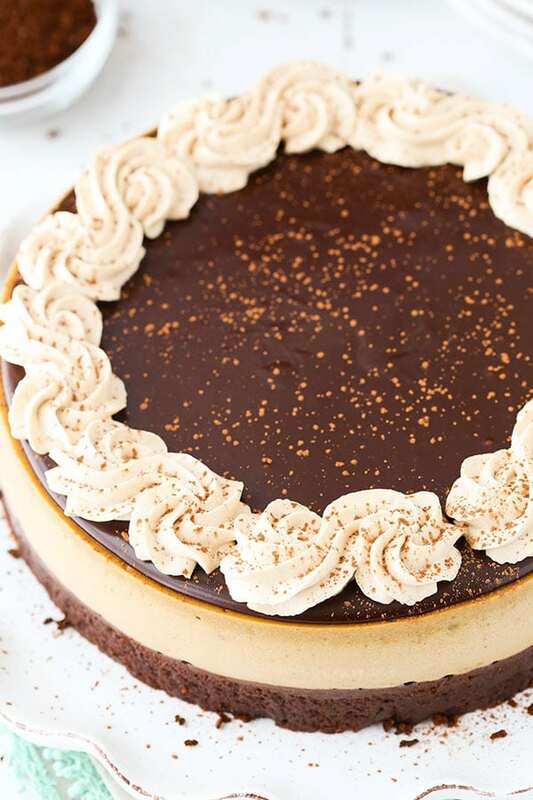 Hi, how do you get the edges so clean after baking the cheesecake? I made this for my husband’s birthday and he LOVED it! On making minis, what would oven temp and cooking/cooling time be for the cheesecake filling? I looked through your other mini cheesecake recipes for hints, but they all varied. So glad he enjoyed it! I’m not sure of the exact back time for minis – especially because this one’s a little different with the brownie bottom. If you try them, just look for the edges to be set and the center to be set, but still jiggly. 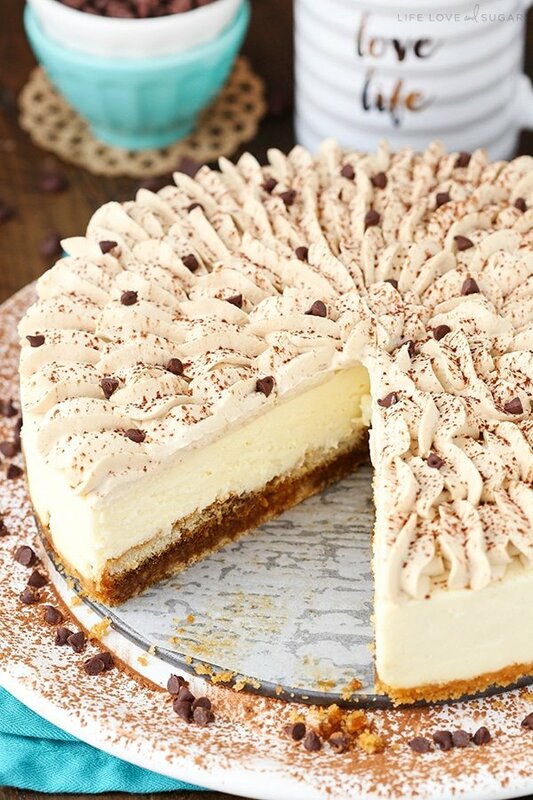 What a wonderful concoction of cheesecake heaven! Just made this a few days ago and it was perfect. 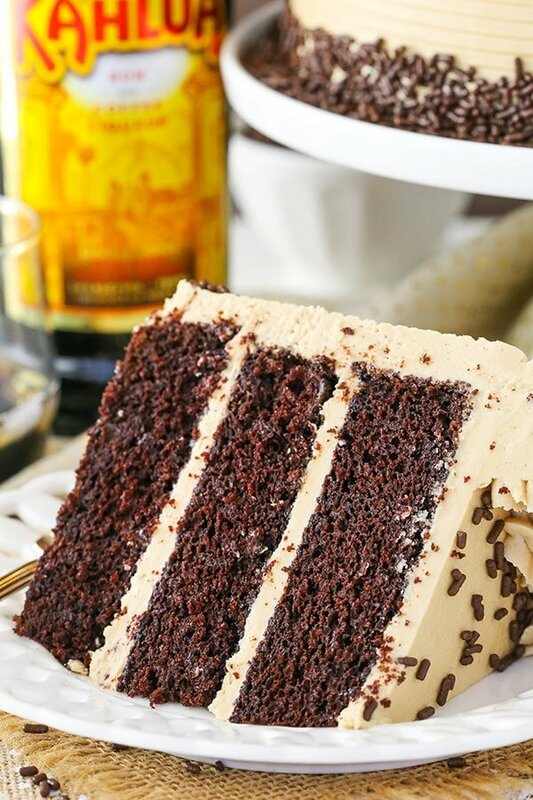 Just the right amount of contrasting flavors that are linked with Kahlua and chocolate. Once I was done making it I didn’t even want to cut into such a great creation, but my god the flavor was perfect. My guests loved it as well. So glad to hear it! Thanks Marc! How does the brownie bottom not get hard as a rock with all the time it bakes in oven? First 25 minutes by itself. Then 1 hr 15 minutes with cheese filling then 30 minutes with oven off with door shut and another 30 in oven with door cracked open? It just doesn’t. It doesn’t keep baking. My brownie ended up beinh really soggy so I had to cut it off and make another brownie bottom. Do you know why this happen? Was I suppose to remove the parchment paper from the brownie first then put it back in the pan before I added the cheesecake? Do you know if your springform pan leaks? It sounds to me like some water might have gotten into the bottom of the pan and made the brownie soggy. Take a look at my tutorial for preventing leaking in springform pans. I use that method every time. Thank you for using metric measurements! Made this yesterday. I love to make cheesecake, this has risen to the number one spot in my book! It is rich, creamy, delicious….and pretty. Your method/timing for cooking and slowly cooling made a crack free perfectly cooked cheesecake. Thanks! The only variation I made was I did the ganache topping in a double boiler as I don’t like microwaving. PERFECT! Everyone LOVED! (And for those concerned about the brownie crust…it was moist and wonderful. Wonderful! So glad to hear it! Thanks Connie! What if I don’t have spring form pan, what alternative can I use? Hi, just made this. So good so good! Only thing is my chocolate gen ache ran all down the sides. Not as pretty as yours, but we ate it just the same. Thank you, will be making is again! I have a springform pan and have made cheesecakes before, but I always have trouble removing the bottom of the pan to place the cheesecake on a cake stand. Do you use parchment paper? What is your secret! 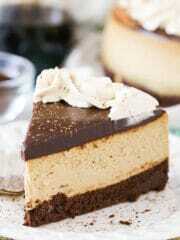 I am planning on making this cheesecake for my Mom’s birthday this weekend. She is a big coffee lover! Yes, parchment paper is exactly what I use. Lindsay-I just made this cheesecake for my son’s 18th Birthday last week. 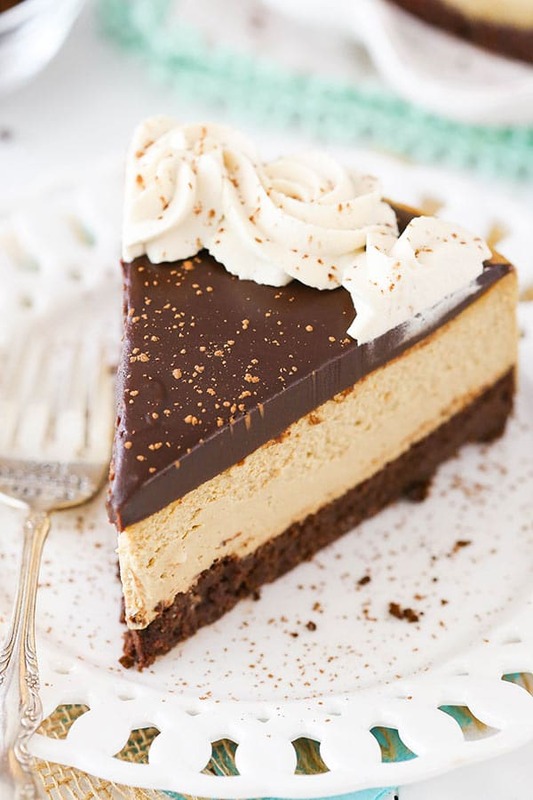 He requested a coffee cheesecake so I googled it and found you. Why have I not found you before? Your recipes all sound so wonderfully yummy & your photos are just beautiful. The cheesecake was a hit! I only changed one thing and that was to omit the kahlua from the whipped cream & instead added 1/2 tsp of instant coffee granules to extra cream. Everything turned out beautifully. This was the first of your cheesecakes that I’ve baked & I’m certainly going to continue this journey. Very impressed! Is there any way you might make a cheesecake with cranberry for the month of December? Thank you so much for sharing your creations! Leaky springform pans are the worst! I’d check out this post. Hopefully it helps! Otherwise you could certainly try the pan underneath. For the article on water bath…trying it now…any tips on speeding up the chilling process? Could I put it in freezer for like an hour? No, I actually wouldn’t try to speed it up. The slow cooling is part of what helps reduce the risk of cracks forming. Overcooking could be due to the convection setting. I would suggest the regular bake setting, otherwise you’d want to reduce baking time. Dang, this was incredible. I used Bailey’s instead of Kahlua and this tasted like it could be from cheesecake factory. Yum! Thank you so much. 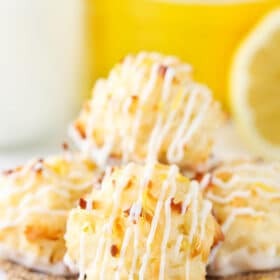 Have you (or anyone else) ever tried making these into individual cheese cakes- cupcake sized perhaps?? I haven’t and I’m not sure about anyone else. It might take a little work, but you could probably do it. The Pan you used is 9″? I’m so glad it was a hit! Thanks Monica! Yes, you can use a box mix brownie. 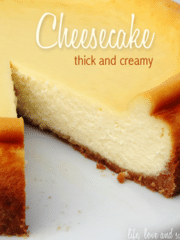 I have made this multiple times and it is the best cheesecake ever! Everyone loves it! I have won first place in a baking contest previously with a oreo cheesecake and this blows it away! Thank you for staring this amazing recipe! Hi, just a few questions. 1. How long does this take to make from start to finish? 2. Will it taste just as good made the day of and placed in the fridge 5 to 6 hours or is it best made a day in advance? 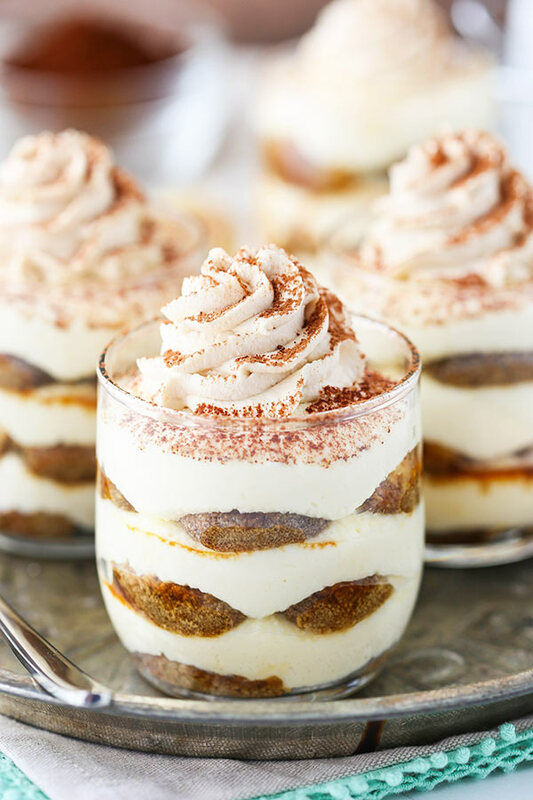 I usually make cheesecakes the night before but won’t be able to so was wondering if I should save this recipe for another day and use one of your other kahlua dessert recipes instead? I usually bake things like this in parts. I’d say the brownie is around 45 minutes to make and bake, plus cooling. The cheesecake filling takes about 15 minutes or so to put together, then baking and cooling time. The toppings should maybe take about 45 minutes or so to make and decorate with, depending on how quickly you work. I would think it’d be ok day of after it’s completely cooled. That’s the main thing is that it has time to cool until firm, which could vary a bit depending on fridge temperature. Thank you! Made it and it was perfect!! I couldn’t find instant coffee but found instant espresso, should I use the same amount or less? Yes, that should be great. You can use the same amount. I made this cheese cake this week. Amazing!! I loved your suggestion regarding placing it in to a larger round pan into the bath as I have never been able to keep my pan from leaking no matter how many layers of foil I use – I even tried a slow-cooker liner! I followed your directions completely. However when I prepare my cheesecake pan, I cut my parchment 2” larger than the pan then snip down 2” all around so the parchment fits well up the sides and adheres to the greased sides. This ensures that as it cools and shrinks it won’t crack when it cools as there’s no chance of sticking to the sides. 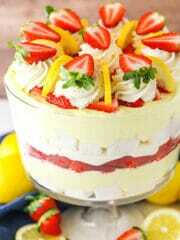 Great cheese cake!! The cheesecake turned rich and decadent.. I had one question though, should i leave the cake out for a bit before serving? The ganache seemed a bit stiff when I cut through to make slices. 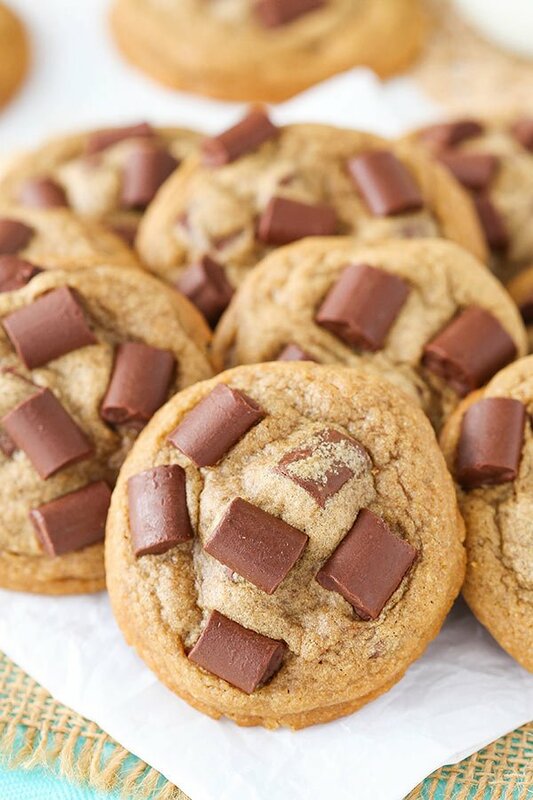 Can I use Bakers semi sweet baking chocolate bar instead of chocolate chips? You could leave it out a bit before serving – totally up to you. And the Bakers bar would be fine, yes. Your recipe sounds so decadent! 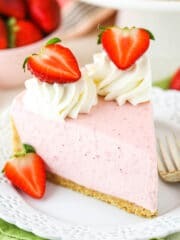 I really want to try it but I had a question, since cream cheese is a little sour wont adding sour cream to it make the cheesecake sour in taste? Also, can I use half quantity of the recipe? You could, but I assume you’d make a smaller cheesecake? No, the cheesecake isn’t sour. There’s plenty of sugar and other flavors added that it’s not an issue. I made this and served to company and everyone loved itt!!! One question when and how do you get rid of the parchment paper? I’m glad it was a hit! 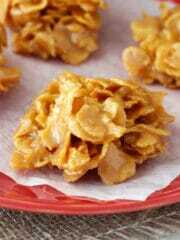 For the parchment paper, you don’t necessarily have to remove it, you can just remove it as you cut pieces. If you wanted to though, you could try to carefully remove it when you move the cheesecake over to a serving plate. I finally got around to baking this cheesecake. It’s been on my must bake list for a long time. This was a huge hit with my family and coworkers. It is an impressive and special cheesecake. Thank you! So glad you enjoyed it! Thanks Lydia! So for the chocolate layering how can I do it differently because when I went to cut it,the chocolate layer was cracking and coming off.Is there a way for it to stick to the cheesecake?Thank you. Hmm, the ganache should definitely stay in place. 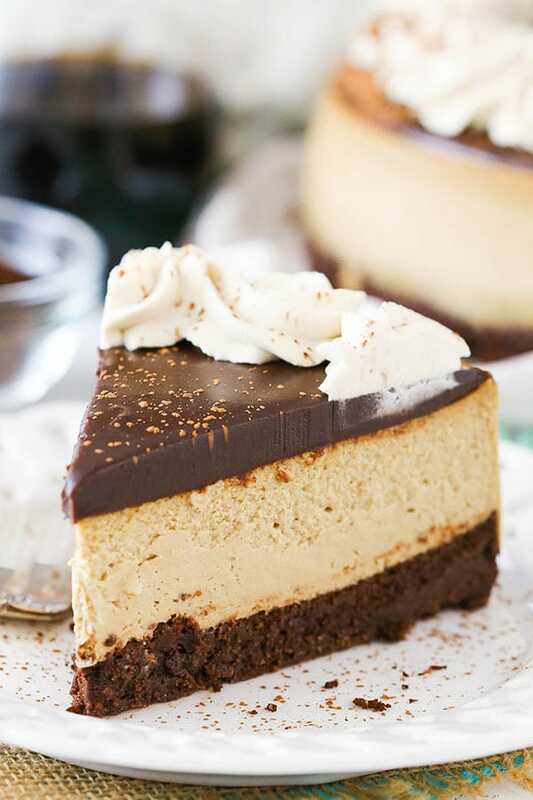 Was there a good amount of condensation on the cheesecake when you added the ganache? Maybe the water from the condensation could have kept it from adhering to the cheesecake properly? I think it must have been the condensation thank you for helping me and for the recipe!!! You can swap out the Kahlua in the cheesecake with water. Depending on how strong you want the coffee flavor, you could also increase the amount of espresso a bit. Just leave it out of the whipped cream and for the ganache, leave it out and increase the heavy whipping cream to 1/2 cup. Enjoy! Made this cheesecake for my brothers bday this past weekend. And omg it was to die for it was a huge hit everybody loved it was so delicious. This will definitely be my to go dessert!! I’m so glad to hear that! Thanks Kelly! Would bourbon work instead of Kahlua? If so, would the amounts added be the same? Also, do you think using dark chocolate would work best with the bourbon? 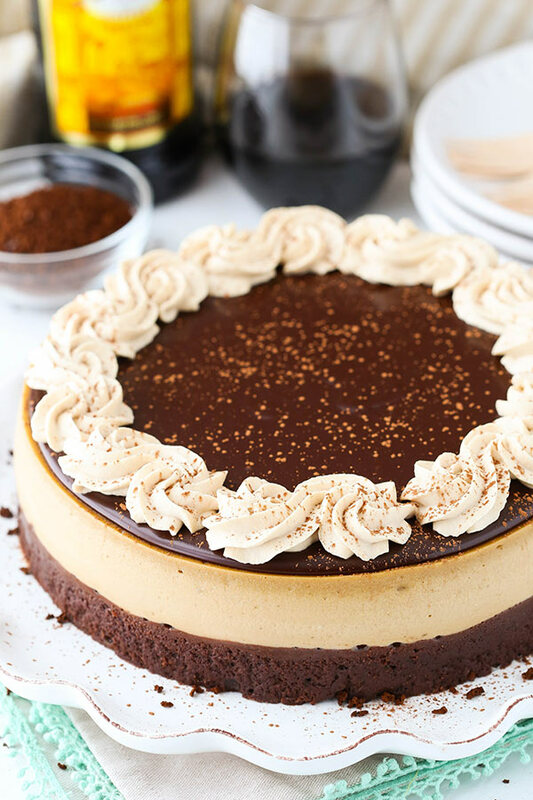 My brother has requested a bourbon coffee dark chocolate cheesecake for his birthday (my family likes to challenge me haha) and your site is always my first stop for my baking recipes. Thank you!! I’m so sorry Kathy! We’ve been having issues with the recipe card this week, but have been working to switch to a new one to fix those issues. It’s a long process that has to be done one recipe at a time (for 600+ recipes). I’m not sure when you last tried to print this recipe, but it has been updated and should hopefully work for you now. If it doesn’t work, you’ll want to try to clear your browser cache and then try again. Sorry for the inconvenience! I made this for my husbands birthday. It came out wonderful! We love dessert but we also prefer them to not be TOO sweet. Therefore I reduced the sugar in the brownie by 50% and in the cheesecake by 25%. Also made it all organic… zomg it was sooo yummy. I can’t wait to try out some of your other recipes! Buying your book too. Keep the recipes coming ???????????? I’m so glad to hear you enjoyed it! 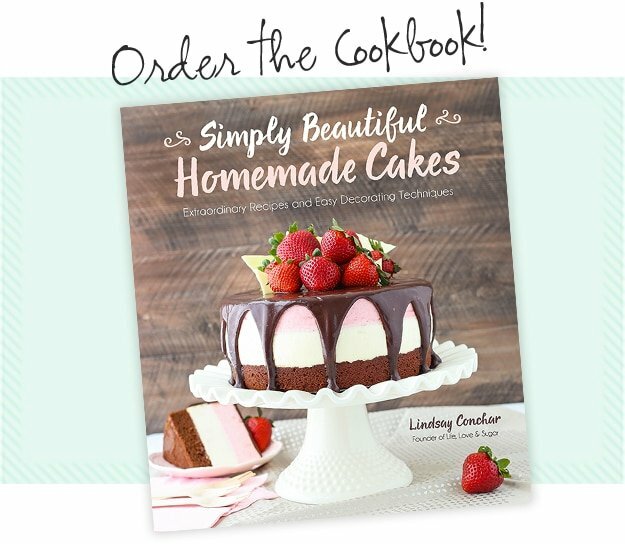 I hope you love the cookbook too! Thanks! Loved this recipe! It is so rich and decadent! 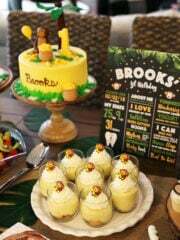 I made it for a baby shower and used a GF brownie mix for the base layer. Next time i will add the mascarpone cheese. I have never had a more difficult time with a recipe as I did with this one. Not all of the volume to weight measurements were correct. It was incredibly time consuming when all said and done. The instant coffee granules wouldn’t dissolve in the kahlua. The ganache recipe didn’t have enough liquid to fully melt the chocolate chips. I had to add a couple of extra tablespoons of heavy cream. I am highly disappointed in this recipe. The cake tasted okay, but not nearly good enough to be worth all of the hassle and time. I’m sorry you had trouble, Katherine, but all the volume and weight measurements are most certainly correct. I actually bake with them myself and used them exactly as written when baking this, so I know they’re right. If your granules didn’t dissolve, your kahlua probably wasn’t warm enough. As for the ganache, there’s plenty of liquid – it’s a recipe I’ve used dozens, if not hundreds of times. If you had extra cream, maybe you should have used it. Did you use the full amount called for in the recipe? Thank you for such a great recipe!! I made this cheesecake for our neighborhood get-together. Nothing but raves and requests for the recipe. Now, I have neighbors telling me it’s their birthday coming up, and would I make them the cheesecake. Loved your tutorial for prevention of water leaking into the cake. Worked wonderfully. This recipe is a keeper! Thank you for sharing. Thank you! I’m glad the tutorial was helpful and you enjoyed the cheesecake! Question: we don’t drink alcohol in these parts, but I like coffee and I like cheesecake, so I want to give this a whirl. Any recommendations on adjustments to make on the coffee measurements, to make up for the missing Kahlua? Will the chemistry of the ingredients be okay to leave it out? 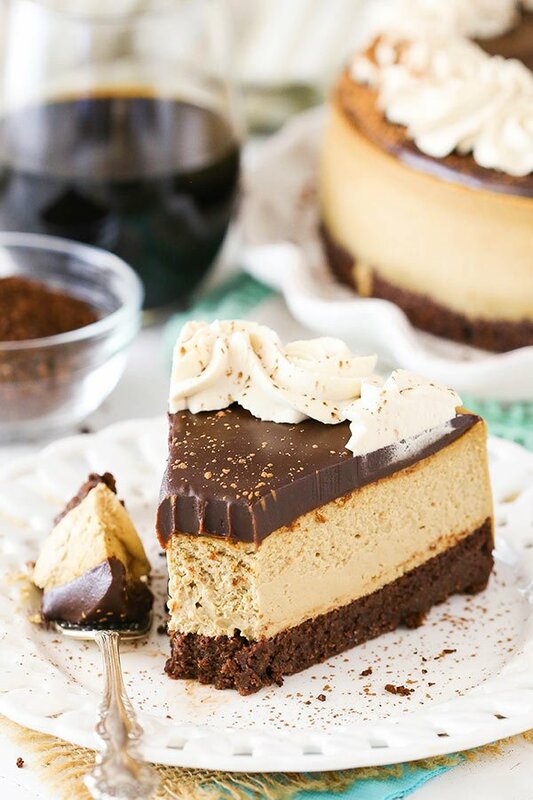 You can swap out the Kahlua in the cheesecake with water. Depending on how strong you want the coffee flavor, you could also increase the amount of espresso a bit. Just leave it out of the whipped cream and for the ganache, leave it out and increase the heavy whipping cream to 1/2 cup. I hope you enjoy!